When most people think about baking desserts with pumpkin, they go straight to the classic pumpkin pie. Now, don’t get us wrong…we love the traditional favorite as much as the next person, but sometimes you’ve got to think outside of the box (or the pie pan in this case). Preheat oven to 350° F. Using a large bowl, beat butter with an electric mixer on medium speed until smooth. Add granulated sugar, baking powder, baking soda, salt, cinnamon, nutmeg and allspice. Beat until combined. Mix in eggs and vanilla. Then, add in pumpkin. Beat until smooth. Start mixing in the flour (if it gets too thick for mixer, use a wooden spoon). Drop dough by heaping teaspoons, 2 inches apart, on an ungreased cookie sheet. Bake for 10-12 minutes, or until tops are set. The cookies should be slightly golden around the edges. Transfer to wire rack when cookies are cooled enough to not fall apart. Allow cookies to cool completely. For frosting, use an electric mixer to combine cream cheese and butter, until smooth. Add cinnamon, vanilla and powdered sugar. Mix together on low speed until thoroughly mixed. Increase speed to medium and whip until the frosting becomes light and fluffy. Spread or pipe icing on to cookies. Store in refrigerator. 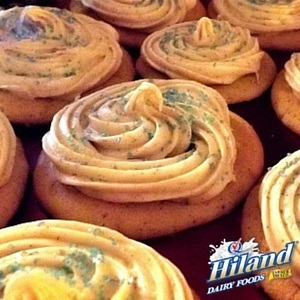 This pumpkin cookie recipe (and photo) was brought to us by by one of our 2015 Hiland for the Holidays Cookie Contest winners, LaTonya M. Keep perfecting your best cookie recipe and don’t forget to enter this year’s Hiland Holiday Home Cookie Contest by December 31, 2015 for a chance to win the prize package valued at $1,000! Your entry may even be featured right here on The Hiland Home!